I did say “everything and all sorts!” …………….So this week I am taking a break from the world of interiors and delving into another design discipline- not to mention major passion of mine: FASHION! 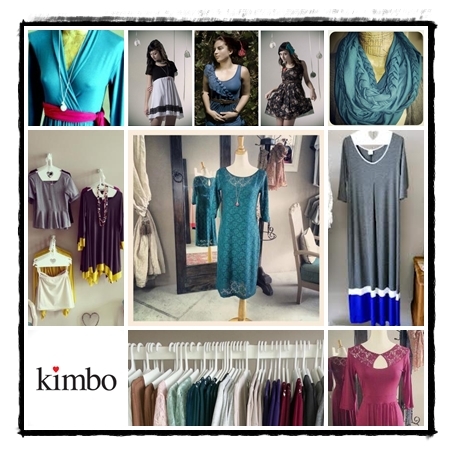 Kim, the owner and designer of the Kimbo label, creates dresses which make her customers “smile” and “feel beautiful” and which make them want to “twirl around with happiness”. If you have been into her store – or met the lovely Kim – you will agree that these words are perfectly appropriate in describing the essence of her label. Her clothes are feminine, girly, fun and definitely conjure images of wearing a little striped dress whilst skipping through fields filled with sunflowers, unicorns, butterflies and rainbows! She is constantly adding new garments to her ‘range’ and also does custom designs for clients. Some of the items currently in-store include lace dresses and tunics in rich raspberry and teal shades, flattering tunics to wear with a cute pair of pumps, and an absolute must-have are the gorgeous plaited snoods for these chilly autumn mornings. What makes Kimbo clothing so great is that it is not too ‘trendy’; the clothing is timeless, comfortable, and will certainly still look fabulous in 2 summers time. Kim is inspired by all things creative. She is interested in all disciplines of design and creativity: from photography to interiors – which I think makes her stance as a fashion designer so much more appealing and interesting as she’s influenced by so much more than just what happened at Milan Fashion Week! • What do you love most about East London? Its small and friendly, there is a real sense of community. It’s also very outdoorsy and relaxing. The beaches.